Variscite is a mineral that is quite hard to find on the market and it is mainly composed of aluminum phosphate with some iron and arsenic traces. The German Johann August Friedrich Breithaupt first described it in 1830 under the name of peganite. He renamed it variscite in1837. Its name comes from Variscia which is the name of the region where the stone was first identified. It can also be found under the names of Alpha Variscite, amatrice, barrandite, bolivarite, lucinite, peganite, utahlite or variquoise. Variscite is generally formed by the contact of phosphate waters with rocks rich in aluminum. It is generally green. Its color can vary from a pale green to an apple green or emerald color. The stone is opaque, slightly glassy. 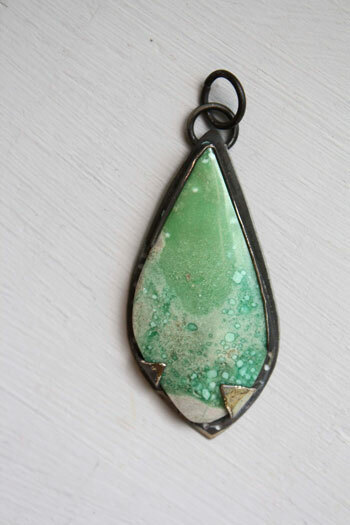 Variscite often shows veins made by aluminum, calcium or phosphate, in white or black color. It is often mistaken with turquoise and is sometimes sold as such. It is quite similar to chrysocolla. It can be found in rarer colors such as purple, orange, pink, red, brown and yellow. Mines: Germany, Brazil, the USA, France, Slovakia, Australia. Variscite would help with memory. It would relieve pains linked to the gout, rheumatisms and ulcers. It would be efficient for stomach acid pains, abdominal pains, and cramps or bloating. 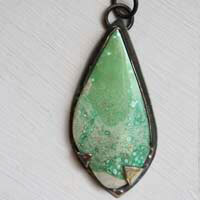 Variscite would allow recovering the elasticity of the skin and veins. It would cure male problems such as impotence.